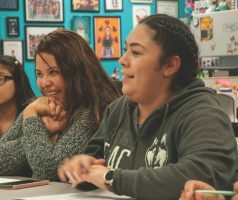 Students who have trouble transfering because of an English or math class may want to look into the Latina Completion and Transfer Academy Club. The club formed from the LCTA program, which offers help with hard-to-pass course. 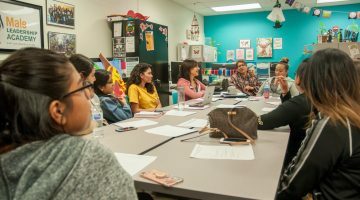 “A lot of our students are non-traditional students that may have been away from school for a few years and our classes all come with a tutor, which benefits the student because they are not taking the class alone they have access to evening tutoring hours with a tutor that is learning the same material that they are,” said Mary Helen Contreras, the club’s adviser and adjunct child development professor. While the program provides the opportunity to for students to succeed in classes, the club provides them with a chance to be a part of college life. Contreras said the club hopes to be chartered by the beginning of next month, which would make this their second semester being charted. The club hopes to continue to work together with the LCTA program and continue to help students in need. For the past four years the program has been helping students complete difficult required classes to transfer to a four-year college. The program offers students help with gate keeper classes, which are classes that keep many students from transfering. Gate-keeper courses include English and math. The only requirement to become members of the academy is to have completed 30 units. The club, however, does not have requirements in order to join. The club not only works with the program, but also helps create awareness of resources available to all students. The program provides resources such as calculators, blue books, specialized tutoring and a place to study. 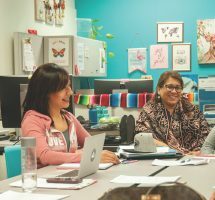 Each class offered by the program also has a paid tutor that sits in class, takes notes and works with the professor to better help students’ with their individual needs. Tutors also work around students’ schedules and on weekends. The LCTA office even stays open later than most offices on campus. “Although it is called ‘Latina,’ it is open to everyone,” said Alvarez. This semester, the club has taken the Male Leadership Program, which is currently dormant, under their wing. Alvarez has also been apart of the Deaf Festival Committee and helped fundraise for the Susan G. Coleman Foundation. Alvarez says she was inspired to be part of the club after being exposed to their resources and finding the support she needed. 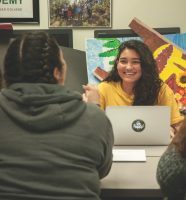 Treasurer of the LCTA club and integrative health major Roxanna Muñoz, a second-semester club member, needed to pass a math class and decided to join the program, as well as the club. “This program is for someone like me who has been here a little longer and has had some issues completing math,” said Muñoz. Muñoz believes the club goes further than just resources and feels it is like a community. LCTA office in D7 is open Monday-Thursday 1:30 p.m.-8:30 p.m. and Friday 10 a.m.- 4 p.m.